It was about one year ago today that I set Tabitha McGruder's hair on fire. She was standing in front of me in a line of people circling the great Font at Grace Cathedral in San Francisco. We were standing there either as sponsors, or catechumens, or individuals wanting to renew their baptismal covenant. Not to worry, Tabitha's hair was quietly and quickly put out by my smacking the back of her head with my program. We should have been bonded by our mutual episcopal confirmation that evening, but the fire is what really ties us together. Danger, crisis, actions and reactions, the unexpected and quiet embarrassment have created a bond. Unfortunately it was not Bishop Swing's light slap or his words of grace that come to mind when I think of this step in my quest for priestly service in the Episcopal Church, but rather this moment with Tabitha. 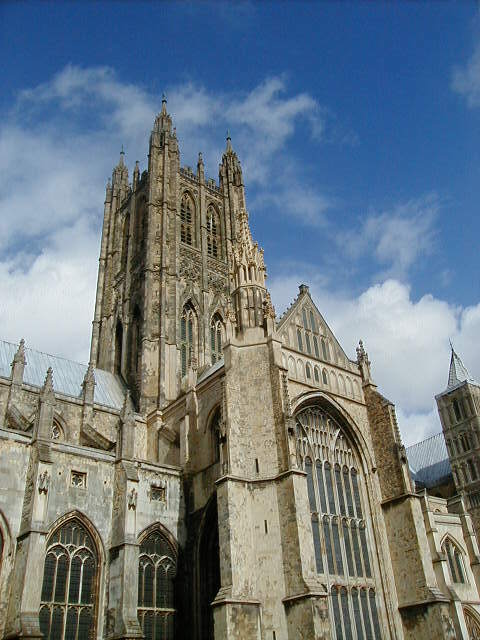 I have not added to my "Journey to Canterbury" for some time; over a year. It is not that nothing has happened, plenty has. I seem to have gone into a trance of reflection, looking at a decision that continues to gain clarity and complexity at the same time. The photograph that accompanies this journal entry was taken by my daughter the evening of the gala that celebrated my ministry at St. Francis Lutheran Church ­ a ministry that I was just leaving. It depicts my attitude then and now ­ an attitude of looking off into the mid-distance, attempting to divine a sign. Perhaps it was the immediacy of the situation with Tabitha's hair that captures my mind, because there seems to be little control over the quest for Episcopal orders. So while I gaze off into probable and improbable futures, there are events that have brought me back to earth, and kept me moving. In just about every Episcopal parish that I have visited, I have always met at least one individual who is questing to be a priest, or a deacon. At Trinity, there are two of us. One, Judy, is seeking to be a permanent deacon. Her quest is in the midst of the life of a successful and very busy restaurant owner. Each of us meets with the Vocations Committee at Trinity, where we are guided, encouraged, listened to, and queried by a group of lay people and some clergy. It is truly remarkable that this type of vocational resource is so readily available to us, and it is a great comfort. It was not my experience in Lutheran parishes that such immediate care and mentoring was available. I know that I mentored one individual into the Holy Ministry, but it was not a concerted effort that involved others. I have a real admiration for how the Episcopal Church handles vocations. They are encouraged by the church in general, and guided into a deliberate and distinctly spiritual process. In the Diocese of California, which "enjoys" a surfeit of clergy, there is still an encouragement of vocations, but there is an equal emphasis on what one is called to do in the ministry that is sought. As I have worked with people at the diocesan and parish level, the question has always been asked, "What is your ministry?" "What do you want to do at Trinity?" "How will you serve?" These questions have engaged me for some time. In my earlier discernment, as a young man seeking ordination in the Lutheran Church, the destination seemed to be more of a hurdle of learning enough Greek and Hebrew, being somewhat familiar with the Fathers, and the Confessions. No one ever asked me what I wanted to do. The expectation was that you did what was necessary, given the situation. Now the discernment is quite different. Being armed with 36 years of ministry, and all the experiences that those years bring, the question is, "What are you going to do with it all, and how will it help Trinity, or St. John's, or what ever particular situation that is in the mix of your ministry. It's a more deliberative process that iterative. I find it to be quite spiritual and healthy. Fr. James Tramel is a remarkable priest. In the midst of his sentence at a California prison, he quite distinctly and clearly heard the Spirit's call to ministry, and pursued that call. Taking classes from the Church Divinity School of the Pacific by correspondence, and relying on the efforts of others in the Diocese of California, he was soon a candidate for ordination to the diaconate, and then later to the priesthood. After a pardon, that was not easily won, he served at Good Shepherd Church in Berkeley, and St. Alban's Church, in Albany. I met James while serving on the Search Committee at Trinity Church in San Francisco, where we found our selves unanimously recommending him to our Vestry as a candidate for Rector of Trinity. 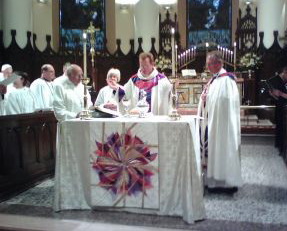 James was instituted as rector on 21 January 2007, and all came to celebrate his new ministry with us. It was a glorious affair, and one in which I was able to take part. What honored me was that I was invited to do so, but also that James has taken the time and effort to honor my ministry. It was the start of moving from hopes for ministry to the reality of ministry with the people of Trinity. It forms a proper foundation from which I can build a more formal relationship with the Episcopal Church. It is a relationship that stems from ministry with the other clergy at Trinity, and with the people of Trinity. Monday next, I shall meet with Canon Michael Barlowe, and we shall discuss the possibilities that are guided by the new relationship that exists between the Episcopal Church and the Evangelical Lutheran Church in America. So the journey continues. It is not a well-marked one. There are twists and turns, moments of pause and acceleration, times of great thought and prayer, and other times of talking and dreaming with others. But the foundation is clear and firm. The ministry that was celebrated at Fr. James' institution was an invitation to me to continue to pursue my own. It is an odd time to be entertaining reception into the Episcopal Church, and into the Anglican Communion. As I write this, there are some thirty parishes in the Episcopal Church that would like to cut and run, and hide under the robes of Archbishop Akinola of Nigeria. The politics and struggle is not unfamiliar to me, having been forged in the fires of the Missouri Synod, and annealed in the troubles at St. Francis' expulsion from the ELCA. It appears that I am jumping into some fresh new frying pan from which I can again launch myself into the fire. The difficulty that has haunted me since my own ordination to the Holy Ministry in 1971, is one of authority and Scripture. This conflict, having now manifested itself in three church bodies, as well as scores of others, is not unfamiliar. It is here, however, in the context of the Episcopal Church, that the conversation is being heard most clearly. As a gay man, it is heartening to hear a national church respond with integrity to the issues of gay and lesbian lay people, candidates for orders, deacons, priests, and bishops. There is an acknowledgement of the reality of the situation, and a determination that it is not going to go away, nor can it be hidden away. I recognize that this is not true in every parish, or in every diocese, but the direction of the national church is clear and unambiguous. For much of the dialogue over the years about these issues in the national churches to which I belonged, the attitude ranged from total denial to a genuine desire to study it to death. The delay in the ELCA makes the hard choices even more difficult and prone to disruption. A direct and clear-cut conversation needs to take place in all the churches in which liberals and conservatives, gay and straight, clergy and laity, need to be forthright and honest in their communication. We all would be better served. Perhaps that wasn't fire in Tabitha's hair ­ but the Holy Spirit that would soon confer upon her special graces. When I look at her, I see a young woman born to a different world than mine, in different circumstances and times than mine. Yet she walks with me on a journey of faith, and it is the Christ in us that binds the tie, informs the conversation, and discounts the differences. I am honored that I walked with her a year ago, and that I continue to walk with her. I hope that it continues.